Sonepur city is located in Northern part of Bihar India. 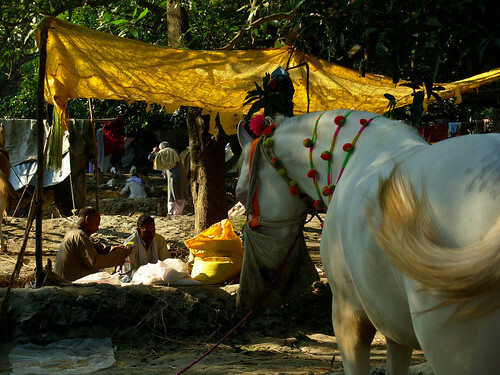 two big rivers of India Ganga and Gandak are here and this mela helds on the banks of river ganga. it is popular and said that this sonepur fair is the one of Asia’s largest cattle fair. the full moon day of Hindu Kartik month is a very auspicious day and this day the sonepur mela starts. People takes holy dip in to the river and then goes for darshan of Hariharnath temple on the day of Kartika Purnima. Religious people offer flowers, sweets etc to god and get blessings for their brighter future and wealth. Sonepue Fair have some historic importance also because of it was the place for camping of royal family. At the time of mela many type of cattle and animals related things are sold and purchased here. A very big number of elephants hources, camel and cows etc. are also sold here in this sonepur mela. Caltural Dances and folk music are another attractions at this fair.